Bruce Trail System at your doorstep. Canada’s oldest and longest marked footpath, the Bruce Trail, spans almost 900 km across Ontario, along the Niagara Escarpment, from Niagara to Tobermory, with an additional 400 km of associated side trails. The Bruce Trail Conservancy, one of Ontario’s largest land trusts, oversees and preserves over 8,000 acres along the trail. Each section has a related Bruce Trail Club, and together they offer numerous ways to get involved and support conservation efforts. When you live at Balmoral Village, this irreplaceable resource is at your doorstep. 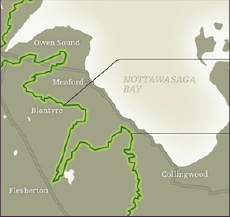 Located where the Niagara Escarpment meets Georgian Bay, the Blue Mountain Collingwood community is proud of its reputation as a ski destination. In summer, the same rolling hills and valleys provide wonderful hiking opportunities with some of the most spectacular views on the Bruce Trail. For information and to join our local branch, the Blue Mountains Bruce Trail Club, visit www.BMBTC.org. You are welcome to join in any of its organized hikes scheduled throughout the year lead by an experienced guide and club member. For information and to join our local branch, the Blue Mountains Bruce Trail Club, visit www.BMBTC.org. You are welcome to join in any of its organized hikes scheduled throughout the year lead by an experienced club member.